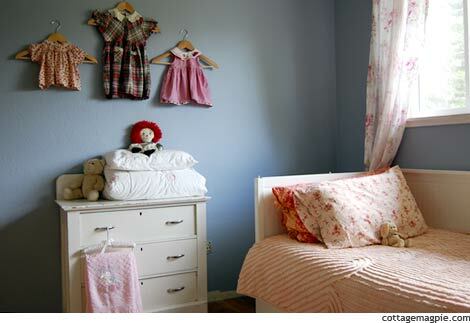 So this is Baby Girl's room. Sharp-eyed readers will notice the missing baseboards and careening dresses. Clearly this is a work in progress. But I wanted to share, anyway! I have to say, I never intended this room to be blue. It was supposed to be cream. The other room is cream. But we shuffled at the last minute to give my son the bigger space and we just didn't have time to paint again. So I've been living with blue... and it's kind of working for me. I like the contrast with the peach and pink. The shots of red are working for me, too. Which is weird. So now I can't figure out what color to paint it. And now would be a good time, because Dutch Boy has asked me to try out their no-VOC paint, and this would be a perfect project. The original plan was cream. I could do that. But then I started thinking darker just to make all the white furniture and light fabrics stand out. Like maybe a dark, warmish pink? But then it would be a sea of peach. Hmmmm. What about periwinkle? I love periwinkle. Or lilac? I want something girly, since she's too little to protest yet, but I'm kind of stuck on keeping the nice contrast, too. I'll just wait here on the daybed, pretending to be a fairy princess. Tee hee.